Spacious, single level Surrey homes for sale that are adjacent to the beautiful golf course at Northview and boasting incredible views of the North Shore mountains or the Fraser Valley are now here at the new launch of St Andrews Surrey homes for sale. 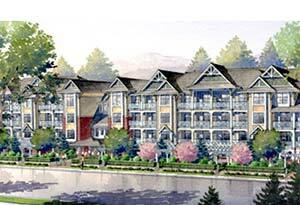 Not only that, but the final selection of new townhomes at the St Andrews at Northview Surrey homes for sale will feature five star amenities that include a fitness centre, sauna, library, 15 seat media room, meeting/conference room and The Duke’s Room (also known as a combination lounge and games room within the clubhouse). Not only that, but the St Andrews Surrey townhomes for sale will also feature a covered outdoor lap pool for resident use. St Andrews at Northview Surrey homes for sale brings a level of elegance you would expect to see in a Shaughnessy or West Vancouver mansion, but these affordable Surrey townhomes are now nearing its final opportunities. St Andrews at Northview Surrey townhomes’ presentation centre is now open at 64th Avenue and 164 Street, Surrey and is open Saturday through Wednesday from 12 to 5pm. Join the sales team and community residents here at the Grand Opening Celebration and Community BBQ for the St Andrews Surrey home development on May 1st! Perfect your lifestyle here at this new Surrey townhome community that has been highly sought after for its idyllic location, proximity to amenities and the Northview golf course. This april is a new benchmark in residential living that will be revealed at the final release of new homes at the St Andrews Surrey townhomes for sale. The grand re-opening celebration and community BBQ will be happening on May 1st, so make sure you drop by. This spring, perfect your lifestyle at St Andrews Surrey homes for sale and experience golf course living at its finest. Discover the comfort that executive quality single level living offers, complimented by the one of a kind mountain and golf course views available at the Surrey St Andrews at Northview home development. Expect nothing by thte best at St Andrews Surrey homes for sale with the highest finishing standards, extensive leisure activities and a pace and convenience that is unparalleled by any other new Surrey condominium development in the area. Call now to learn more about St Andrews Surrey homes or visit standrewsliving.ca for more information. West on the Village Walk Cloverdale Condos for Sale – Grand Opening This Weekend! The grand re-opening of the Cloverdale real estate community at West on the Village Walk condos for sale is happening this weekend, Saturday and Sunday from noon to 5pm! With one bed (some with dens), and two bedroom (some with dens) affordable Cloverdale condos for sale, the West on the Village Walk condos will be ready to move in this September 2009. The much anticipated completion of the Cloverdale West on the Village Walk real estate development is now here. Wallmark Homes is pleased to announce the West on the Village Walk Condos Grand Opening Release on Saturday and Sunday, September 12th and 13th, 2009. Spaciously designed Cloverdale condos for sale that range from six hundred and seventy three to one thousand and five square feet in the heart of the downtown Cloverdale real estate market place are now selling this weekend. Impeccably designed Cloverdale homes for sale at West on the Village Walk development with incredible attention to detail are all backed by the experience of a quality home builder at Wallmark Homes. Built by Wallmark Homes with over 20 years of trusted home building experience. For more information about the new Cloverdale condos for sale at West on the Village Walk and its Grand Opening Release, please call 778.571.1308 or visit www.homesatwest.ca. Book your personal viewing of the remaining Cloverdale condos for sale today located at 17712 57 A Avenue in Cloverdale along the border with Surrey. All Cloverdale homes for sale are backed by the Travelers Warranty. Vancouver home buyers are now heading out to the West on the Village Walk Wallmark Homes in Cloverdale real estate market. Presenting an urban community within a truly agricultural and peaceful neighbourhood, the West on the Village Walk Cloverdale condos for sale is part of this growing city with a small time charm. From tree lined streets to pedestrian friendly walkways and from family friendly homes, the Cloverdale West on the Village Walk is a lowrise condo development featuring brand new high quality homes that are just within walking distance to the downtown shops, restaurants, Cloverdale Exhibition Grounds, services, amenities, the Cloverdale Rodeo, libraries and schools. Just fourty minutes away from downtown Vancouver, the presales Cloverdale condos at the West on the Village Walk community will be close to the US border, Highway 99, 10 and 91 in addition to the Fraser Highway, making it very accessible from all directions. Anticipating a grand opening success, the release of the remaining presales Cloverdale condos at West on the Village Walk is happening this weekend in September 2009. Not only that, but these affordable Cloverdale homes will range from only $189,000 to about $259,000, representing great property value for these modern and well finished condominiums. Crafstman architecture, balconies, open living floor plans, energy efficient fireplaces, appliance sets, maple shaker cabinetry and nine foot ceilings are just some of the great features presented by Wallmark Homes here at the Cloverdale West on the Village Walk community. Coming later this year, Saddle Creek Cloverdale real estate will be a neighbourhood of 100 single family homes located in Cloverdale BC. 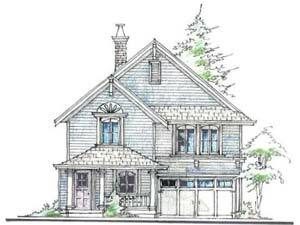 Drawing inspiration from Farmhouse architecture, these pre-sales homes are reminiscent of times when pre-construction homes were built for practicality, prity, and endurance combined with today’s most advanced, innovative construction technologies to minimize maintenance while maximizing durability. From welcoming front porches at the pre-construction Cloverdale Saddle Creek family homes to open concept floor plans, these presales homes give you the best of both worlds – traditional styling on the outside and contemporary comfort inside. Ranging from 3,000 to 3,550 square feet including unfinished basements, these three and four bedroom single family pre-sales homes at Saddle Creek in the new Cloverdale real estate property market include gourmet kitchens with granite counters, spa-like master ensuites, eco-friendly flooring and carpeting, and Kohler plumbing fixtures. Designed to BuiltGreen Gold standards ensures that these new Cloverdale homes at Saddle Creek community are healthy, energy efficient and are a solid real estate investment opportunity. For more details, please visit www.morningstarhomes.bc.ca. Published by Westcoast Homes and posted here to attract savvy home buyers to this most exciting new real estate property development in the heart of Cloverdale. St. Andrews – Remple Devleopment’s Cloverdale community draws young urban professionals who appreciate the size of these condominiums and the fact they receive so much more for their money compared with downtown Vancouver. Cloverdale is moving from a sleepy bedroom community to a thriving one – it has the distinction of being one of the fastest growing cities in BC. Construction real estate is booming but there is one development that stands above the crowd and it’s creating quite a buzz. So no wonder. Cloverdale’s St. Andrews condominiums at Northview took its inspiration from the award winning condominiums in Vancouver’s Coal Harbour. This beautifully appointed 10 acre gated community offers uncompromising splendour and elegance for less than you would pay in the Lower Mainland. Move In Today! St Andrews at Northview Cloverdale Homes for Sale! Purchase a thirteen hundred square foot two bedroom and den Cloverdale home for sale today from just $1,290/month according to their latest sales incentive (check sales staff for details). New hot summer deals are now available at the Cloverdale St. Andrews at Northview real estate development that features only seven executive homes remaining for sale. Single level living along a golf course, five star amenities and services just steps away and the most spectacular views of the Lower Mainland is now more affordable then ever. The new Cloverdale St. Andrews condos at Northview golf course features some of the most elegant and traditional Shaughnessy style condominiums available in the region and the last or third phase of the development is now launched. Now complete, potential condo buyers can actually see the particular unit to make sure that it feels perfect in person before going ahead and putting an offer down, so there are no presales condo worries for Cloverdale homebuyers here. In addition, the arched doorways, large long soaker tubs and huge windows are just some of the stunning features at the recently completed St Andrews at Northview Cloverdale condo homes. In addition, there are gas and water hook-ups on all outdoor patios and balconies here in addition to detailed luxuries including in floor radiant heating, gourmet kitchens and laminate hardwood flooring, something that you don’t see in the new Cloverdale real estate market. Also, living in a resort type community has its perfects. As far as on site amenities go, the new Cloverdale condos at St. Andrews at Northview golf course features a fifteen seat media screening room, sauna, library, fitness centre, kids room, meeting room and The Duke’s Room which is a combination of both a games and lounge room for residents to use at their leisure. In addition, there is an outdoor lap pool at the presale Cloverdale condominiums at St. Andrew at Northview condos in addition to a cabana type deck with outdoor furniture. 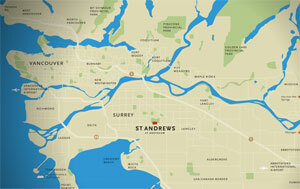 For more information, please visit the Surrey sales centre for the St. Andrews condo homes. You can also visit www.standrewsliving.com today. St. Andrews at Northview condos consists of 219 luxurious, spacious two bedroom and den condominium homes ranging in size from 1264 to 1886 square feet in eight, three storey buildings. Even the most discerning home buyer will delight in the fact that every condo suite at St. Andrews at NOrthview in Cloverdale comes with standard finishes that will leave a lasting imprint. Enter through classic flat-panelled doors with elegant polished chrome Weiser hardware, and the onto the richly stained, engineered hardwood floors with in-floor radiant heat, to the thick carpets in the bedrooms. Oversized windows allow lots of sunshine in and overlook large, private patios. For those who love to cook and entertain, the gourmet kitchen at the condos at Northviews’ St. Andrews Cloverdale development is a dream – floor to ceiling contemporary flat panel wood cabinetry, sleek, stainless steel kitchen appliances, granite counters, deluxe stainless steel hood fan, and much more. Young, hip urban professionals are drawn to St. Andrews condominiums in Cloverdale in droves because of the sophistication and quality of craftsmanship they are finding here. St. Andrews at Northview is like owning a little piece of heaven. Where else can you lay claim to living close to Northview Golf Course – a 36 hole Arnold Palmer signature design PGA course – as well as award winning wineries, restaurants, high-end shipping, beaches, and much more. Superior quality is evident in every detail and finishing at Northview Cloverdale’s St. Andrews condo residences. “Young professionals are amazed at what they are getting for their money,” says Krstin Dingwall, sales associate with the Platinum Marketing Group. “Also, the strata fees cover the in floor heating system and the hot water.” The piece de resistance has to be the impressive 8,000 square foot clubhouse inspired by Frank Lloyd Wright, one of the world’s most prominent and influential architects. The stunning St. Andrews Clubhouse at Northview, Cloverdale, will include an outdoor pool, guest suites, state of the art fitness centre, billiards, bocce, outdoor patio and barbeque area – it is truly a playground oasis. The five-acre grounds at Northviews’ St. Andrews condominiums surrounding the clubhouse and homes will feature gardens, an impressive waterfall, and walking trails around the entire property. Heated lap pool, decks, putting green and landscaped walkways complement this gem. The Rempel Development Group has been in the industry for more than 40 years and has built more then 2,500 homes. Phase 1 of St. Andrews at Northview in Cloverdale has four condo units left and Phase 2 is sold out. Phase 3 is more than 50 per cent sold and occupancy date is fall 2008. For more information visit www.standrewsliving.ca or phone 604.575.8788. You can visit the St. Andrews condo presentation centre at 64th Avenue and 164th Street in Cloverdale and it is open daily except Fridays from noon to 5p.m. The executive lifestyle is now complete as the unveiling of the St. Andrews Clubhouse is taking shape right now. An impressive 8.540 square foot facility at the St. Andrews at Northview Surrey real estate development features an unprecedented number of community amenities that include a 2000 square foot party room with barbeque patio, perfect for entertaining guests during warm summer days as well as a 15 seat surround sound, hug screen theatre for previewing movies and sports events with friends. The new Surrey St. Andrews Clubhouse also features a sauna and steam room, state of the art fully equipped exercise fitness facility in addition to a spa heated pool and whirlpool only for St. Andrews residents and home owners. In addition, the new St. Andrews Clubhouse also features a gathering room with billiards, bar, and private wine lockers for homeowners here in this new Surrey real estate development that still features some presale homes that are exclusive two bedroom and den units between 1264 and 1886 square feet in size. These pre-construction St. Andrews homes start from just $345,900. Developed by Rempel St. Andrews Development Limited, this new Surrey real estate property has a marketing web site at StAndrewsLiving.ca or you can call 604.575.8788 for details about remaining presale St. Andrews condos for sale. As Susan B for the New Homebuyers Guide visited the Surrey St. Andrews Clubhouse last month, this is what she, and Darlene, the sales rep, had to say: Since the St. Andrews Clubhouse is now open, Darlene was anxcious to show me around. The Duke’s Room at the new St. Andrews Club House (aka combination lounge and games room) looks as if it just stepped off the pages of a magazine featuring English country manors. The Duke’s Room has dark stained wood, a sweeping bar larger than you’ll see in many pubs, dual wine fridges and private wine lockers too for residents at the St. Andrews at Northview Homes. The fitness centre, sauna and media room with tiered seating in addition to the crafts room for kids and meeting/board room finish out some other impressive sections of the St. Andrews Clubhouse at Northview Homes. Spacious, elegant and welcoming, the lounge area with three internet stations also has a peek-a-boo view to the adjacent Surrey NOrthview golf course. This refinement and attention to detail makes the pre-construction homes at Surrey St. Andrews at Northview real estate development truly spectacular. Selling their final phase of presale Surrey homes, the Surrey St. Andrews at Northview spacious two bedroom condominium residences are starting from the low $300s. The St. Andrews Condos at Northview Surrey apartment development presentation centre and display suites are now open noon to 5pm at the St. Andrews Clubhouse at 64th Ave and 164th St in Surrey real estate market. Call 604.575.8788 or visit standrewsliving.ca for more info. Go west on the Village Walk and ask about their spring bonus of $10k value! Get everything you want! Oversized, sensible floor plans. Walking distance to shoping and amenities. Experience the history of Cloverdale BC. Spectacular penthouse floor views. Timeless craftsmanship by Wallmark Homes with over 20 years of building experience. 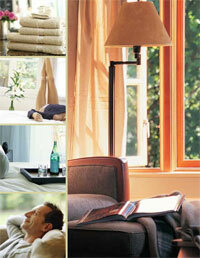 Discover your direction (an article published in the New Homebuyer Guide and written by S Boyce. It’s no secret. I have a soft spot in my heart for Cloverdale. In large part, it’s about this community’s ability to combine the best of its whimsical, Western character with a distinctly fun loving view to the future. Apparently, I’m not along. “There is just so much going on here,” says Christina Sutton, sales representative at West on the Village Walk in Cloverdale real estate. Rapidly she lists off just a few of the events that attract people from across the Lower Mainland and sometimes from around the world: the famous Cloverdale Rodeo, the Blueberry Festival, and Bed Races and Kid’s Bike Parade. “And the City of Surrey is investing over $2 million into even more improvements to the downtown core – more hanging baskets ont eh street lamps, more landscaping, a pedestrian overpoass on 176th Street plus there’s a Granville Island style public market in the planning stage.” And at the heart of all this, West on the Village Walk Cloverdale new homes Is clearly turning heads among home buyers looking for something just al ittle different. She’s not kidding either. Right across the street is the historic Clova Movie Theatre. A short stroll brings you to the local bowling alley boutiques, restaurants, and some of the best antique shopping in the Lower Mainland. Feeling like Lady Luck is on your side? Perhaps an evening at the casino or Fraser Downs Race Track is the thing to do at the West on the Village Walk real estate development in Cloverdale. Moms and dads can be comfortable knowing there are schools at all levels close at hand to the pre-construction Cloverdale West on the Village Walk homes and when you’re ready expand your own horizons, be sure to check out the offerings at the new Kwantlen University College’s brand new campus. Designed with sophistication, contemporary architecture, West on the Village Walk still pays homage to the town’s railway heritage. Inside the presentation centre, West on Village Walk in Cloverdale’s display kitchen cabinetry is a rich, warm maple perfectly paired with stainless steel appliances and natural teak laminate flooring. Another is the sheer variety of living spaces. With nine floor plans to choose form at the Cloverdale real estate offerings at the new West on the Village Walk development – each named after one of the many local parks and golf courses – West has something to offer everyone from first time buyers to snowbirds loking for the conveinece of a lock and go lifestyle. Christina adds there are veen parents who want to downsize from their family home and then help their adultchildren purchase a suite at West on the Village Walk real estate Cloverdale development. And I can’t help smiling to myself when I discover that the two city-savvy colour palettes are named Ironwood and Tumbleweed – a charming, ever so slightly sassy acknowledgement of the cowboy heritage Cloverdale real estate has long been known for. West on the Village Walk is a collection of 60 one and two bedroom condominium Cloverdale homes with den or flex space and is located in the heart of Cloverdale real estate. Prices of the West on the Village Walk condos start from $234,900. The presentation centre for the West Condos in Cloverdale and display suite are open between noon to 5pm daily except Friday and is located at 5723 – 176 Street in Cloverdale. For more information call Kim (Royal LePage) and Tina at 778.571.1308 or you can visit the Cloverdale West Condos at Village Walk website at www.liveatwest.ca. BIG West on the Village Walk Apartment Homes Re-Launch Party on Saturday, September 27th from noon to 5pm. Come join the fun! Own a new Cloverdale homes for just $200 bi-weekly. Based on mortgage rates based on prevailing banking interest rate at the time of printing for a 35 year residential mortgage with a 5 years term at a 5.6% interest rate which is to be held until completion. Payment based on a 24 month buydown payable to the purchaser by lump sum at the time of completion of your home at West on the Village Walk Cloverdale real estate development, this amount is not to exceed $21,000. Payments calculated on 20% down with GST and does not include customary closing/banking costs and monthly strata fees for your new Cloverdale home at the West on the Village walk master planned apartment development. Promotion is now in effect until 09/11/08 is non transferrable. This is a limited time promotion subject to conditions and only available on select presale Cloverdale West Condos on the Village Walk development. Luxury living at affordable prices are now available at the newly re-launched final release of Cloverdale homes at the West condominiums on the Village Walk, one of the most sought after developments in the city. Live large at West! Spacious floor plans up to 1,051 square feet in size. With only 60 exclusive presale Cloverdale condo residences, West on the Village Walk apartments are built by Vancouver’s leading real estate developer, Wallmark Homes, with over 20 years of building experience. Enjoy all your favourite restaurants, shopping and activities by foot in a charming Cloverdale neighbourhood rich in culture and history in a central location with easy access to both Highway 10 and Highway 99. Real estate investing wisely at the presale West Cloverdale on the Village Walk condominium apartments. Get in early on Cloverdale real estate’s exciting redevelopment plan and one of the fastest growing communities in the Lower Mainland. The Wallmark Homes West on the Village Walk Cloverdale condo apartments presentation centre is now re-opening at 5723 176th St (176 St and 57th Ave) in the heart of Cloverdale real estate market and is open everday noon to 5pmm (except Friday). You can call Kim for your personal appointment and home tour at 778.571.1308 or visit the West on the Village Walk website at www.liveatwest.ca for a personal tour online. Update on the Cloverdale West on the Village Walk Condominiums – Live Mortgage Free for 16 Months Promotion (see sales staff for details) Why rent when you can own? Roof on Party at the Cloverdale West Condos on the Village Walk Saturday November 8th from noon to 5pm with FREE lunch! The offer for the 16 months free mortgage promotion is only for the next 8 pre-sale condo homes purchased by homebuyers. When you purchase at West on the Village Walk Cloverdale condominium homes, you can live mortgage free for the first 16 months. Discover the difference of owning a pre-sale Cloverdale new home that reflects your taste and style. Spacious one bedroom suites at the Cloverdale West real estate development are priced from only $234,900. Call 778.571.1308 today for your free guided home and site tour by Wallmark Homes. A thriving and bustling community in Cloverdale now presents special purchase incentives for first time homebuyers at the West on the Village Walk Wallmark Homes real estate development. With a lot going on in Cloverdale including the Rodeo, Blueberry Festival, Bed Races and lots of events for children, this is the community to be in. And with City of Surrey is investing over two million dollars more into improving the downtown Cloverdale real estate corridor for beautification and liveability with a Granville Style community in mind. West Condominiums on the Village Walk in Cloverdale presents only sixty one and two bedroom condo homes with dens and flex spaces for sale. These pre-construction Cloverdale condos start from an affordable price point of $234,900 and they are located at 5723 – 176 Street. With over two decades of experience in building Wallmark Homes is the master mind and developer behind the West Cloverdale on the Village Walk condominiums and some of the greatest strengths behind this builder is that more than 85% of the trades people have been with them for more than 15 years. Located along the border of Surrey and Cloverdale, the West on the Village Walk presents the latest release of condos for sale at 5723 – 176 Street. A collection of only sixty one and two bedroom homes with den or flex spaces, the West on the Village Walk condominium homes features maple cabinetry, nine foot ceilings and the warmth of natural teak laminate flooring. Spacious balconies and open floor plans at the pre-construction Cloverdale West on the Village Walk condos for sale are contemporary and stylish. The property perks at this Cloverdale Surrey real estate development at the condominiums at West on the Village Walk represents the only condo construction property in the heart of Cloverdale real estate and you’re within walking distance to shopping, restaurants, antique stores, and all the family oriented events this neighbourhood is so famous for. The price point for the Village Walk condominiums in Cloverdale real estate starts from $234,900.